SoundPrintÒ continuous acoustic monitoring detects and locates corrosion induced failure of tensioned steel elements in post-tensioned concrete construction, cable stayed bridges and cable stay bridges. 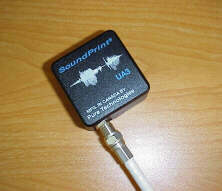 The monitoring system uses acoustic sensors distributed about the structure. Data is processed on site and transmitted over the Internet to a central processing facility where proprietary processing software is used to generate reports summarising the time, location and classification of recorded events. Project details are provided from the Bronx Whitestone Suspension Bridge in New York, the post tensioned concrete Huntingdon Railway Viaduct in England, and other bridges in Europe. The technology has been used extensively for monitoring concrete water pipes in the arid regions of the USA. 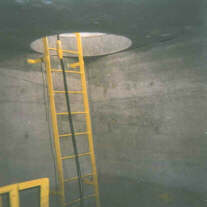 More recently SoundPrintÒ has been used to provide seismic surveillance on concrete water tanks in California. The use of high-strength steel wire has contributed greatly to advances in structural design and structural performance over the last hundred years of so. Unfortunately, this increase in strength has not been accompanied by a corresponding increase in durability. In addition to conventional dissolution corrosion (or rusting), these high-strength steels are susceptible to failure through brittle fracture caused by stress corrosion, hydrogen embrittlement and fatigue. These corrosion mechanisms cause a significant loss of ductility in the steel, and failure can occur without a gradual loss of cross-section in the wire (Figure 1). Loss of ductility is not always accompanied by a reduction in ultimate strength. Studies have shown that galvanized wire is more prone to embrittlement than non-galvanized wire when the galvanizing is damaged or locally depleted. It is important to note that, although chlorides and other contaminants can accelerate embrittlement, water and oxygen are the only ingredients necessary to initiate the process. For this reason, embrittlement has been found in post-tensioning strands in completely enclosed, climate controlled high-rise buildings where rainwater has entered the tendon system during construction. The presence of corrosion in high-strength steel wire in bridges can have serious consequences. The Ynys-y-Gwas Bridge in the United Kingdom collapsed in 1985 as a result of corrosion of the post-tensioning system. A major program of inspection of the grouted post-tensioned bridge stock in the U.K. was then initiated. At least four other Bridges were decommissioned and replaced because of serious corrosion problems. In 1992, The Highways Agency in UK introduced a moratorium on the use of grouted post-tensioning in their bridges pending the development of improved detailing, grouting procedures and quality control measures. Corrosion has also been found in post-tensioned bridges in France, Germany, Italy, Denmark, Japan and the United States. Severe corrosion and extensive wire failure has been discovered in the main cables and in the hanger systems of a number of suspension bridges in North America and Europe (Figure 2). This has resulted in expensive rehabilitation projects in many instances and replacement of the main cables of the Tancarville Bridge in France and the General Grant Bridge in the U.S. Complete hanger systems have had to be replaced on the First Severn Crossing and, more recently, on the Forth Road Bridge. Corrosion-induced failures of stay cable wires have been documented in China, Argentina, Venezuela and Germany. 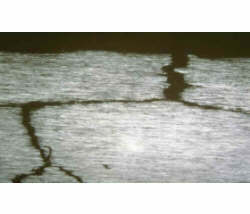 In most cases, corrosion of high-strength steel wire in bridges is not visually evident. Grouted post-tensioned tendons are obviously not visible. The circumferential wire wrapping on suspension cables and the steel or polymeric protective sheathing on stay cables preclude non-intrusive visual inspection. Even for the hangers (suspender ropes) of suspension bridges, where corrosion is most likely to occur at the deck-level socket connections, the absence of visible wire breaks in the outer layer of wires cannot eliminate the possibility of internal breaks. Similar problems with post-tensioning wire have been evident in other types of application including buildings (post-tensioned beams and slabs) and large diameter water pipelines. Many structures exist where there are major concerns about the integrity of the post-tensioning in building structures, and owners and consultants have developed extensive strategies including replacement and inspection. For the large diameter water pipes (Precast Concrete Cylinder Pipe) concerns were such that a Users Group was initiated to share experiences on repair and maintenance. To date, over 600 major ruptures of PCCP have been reported due to failure of the tensioned wire wrappings. Engineers have had to rely on intrusive investigations or on the use of available non-destructive evaluation techniques to provide some information about the condition of these components because of their inaccessibility. These methods have serious disadvantages in terms of sampling reliability, accuracy, cost, and disruption. Most of the methods used to investigate the condition of stressed wires in post-tensioned concrete structures and bridges involve a representative sampling of the overall structure. (A summary of the techniques used to investigate many forms of structure construction in included in the paper by Elliott). Hence, there is a possibility that corrosion and wire failure in localized areas may not be detected. A comprehensive health monitoring system that can provide information on deterioration for the entire structure would be useful for determining where to investigate and would also provide information about future performance once an investigation or repair has been completed. A continuous acoustic health monitoring system developed for this purpose has been applied to many bridges (suspension, cable stay, post-tensioned concrete), post-tensioned structures and PCCP water pipes (precast concrete cylinder pipe). The principle of examining acoustic emissions to identify change in the condition of the structural elements is not new. However, until recently, continuous, unattended, remote monitoring of large structures was not practical or cost-effective. 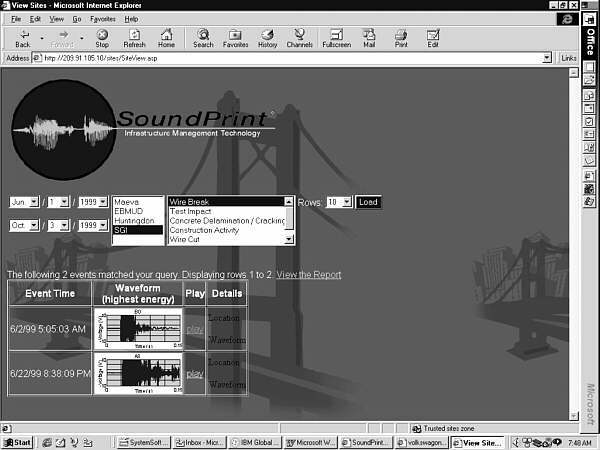 The availability of low-cost data acquisition and computing hardware, combined with powerful analytical and data management software, resulted in the development of a continuous acoustic monitoring system called SoundPrintÒ, which has been successfully applied to bonded and unbonded post-tensioned structures and bridges in Europe and North America since 1994. The system has been developed from the observation that failures of prestressing wires generated an audible acoustic response. Pure Technologies reasoned that if these events had frequency or energy characteristics sufficiently different from ambient acoustic activity in a structure, it would be possible to identify the events, as well as their location and time of occurrence, with an appropriate instrumentation, data acquisition and data analysis arrangement. This would permit the non-destructive identification of broken strands so that these strands could be replaced periodically as part of a long-term, cost-effective structural maintenance program. A prototype monitoring system was installed in the 6,000 square-meter ground floor of a building in Calgary, Canada in February 1994. The system consisted of an array of sensors (Figure 3) connected to an acquisition system (Figure 4) with coaxial communication cable. The sensors were broadband piezo-electric accelerometers, which were glued to the underside of the concrete slab with cyano-acrylate adhesive. Sensor locations were chosen so that an event occurring anywhere on a slab could be detected by at least four sensors. The structure was divided into three acoustic zones delineated by expansion joints. A total of 60 sensors were used resulting in a density of one sensor per 100 square meters of slab area. A spatial multiplexing technique was employed to acquire data from the sensors using only 32 acquisition channels. For unbonded structures, sensor density varies between one per 35 to 100 square meters, depending on the geometry of the structure. Fig 3: Standard sensor for buildings and parking structures. Fig 4: Typical site-based acquisition unit. The goal of continuous automated monitoring combined with low-cost, centralized data processing was central to the development of the technology. Original software consisted of a commercially available data acquisition package located at the site computer, and a proprietary data analysis and report generation package located at the processing facility. The data acquisition software was later replaced with more suitable proprietary software. As a partial strand replacement project was being undertaken coincident with the installation of the system, it was possible to acquire data from many wire breaks. This information was used to train the data processing software to "recognize" wire breaks. When events possessed all the known properties of a wire break, they were classified as "probable wire breaks". Events possessing some of these properties were classified as "possible wire breaks". All other events were classified as "non-wire break events". By analyzing the time taken by the energy wave caused by the break as it traveled through the concrete to arrive at different sensors, the software was able to calculate the location of the wire break, usually to within 300 - 600 mm of the actual location. From the beginning, the capability of the system to accurately identify and locate wire break events was remarkable. Independent testing showed the system to be 100% correct when spontaneous events classified as "probable wire breaks" were investigated. 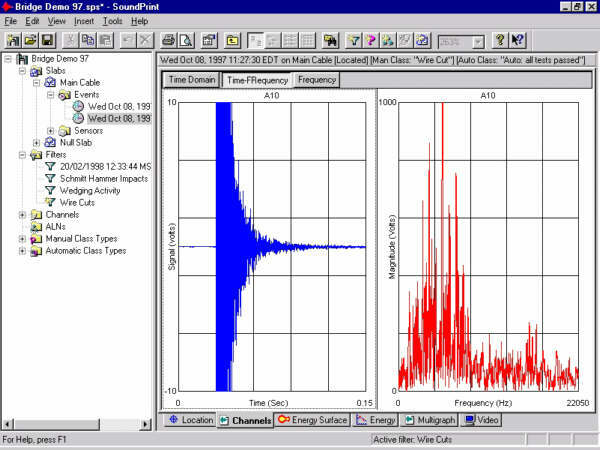 Figure 5 shows a typical acoustic response to an unbonded wire break at a sensor 10.0 m from the break location. Figures 6 and 7 illustrate how the system locates events. 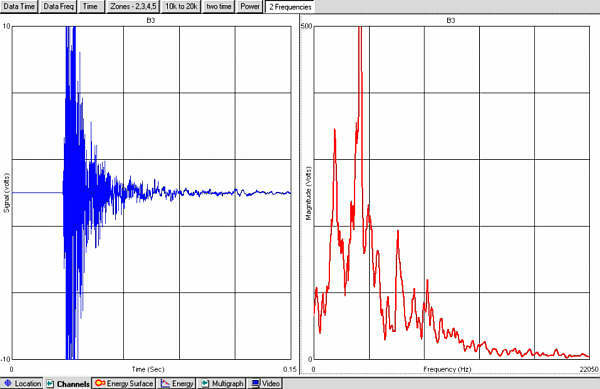 Fig 5: Time domain and frequency spectrum plots of wire break detected by sensor 10.0 m. from event. Fig 7: Analytical software generates graphical representation of event location algorithm for high-rise building slab. Initially, data transfer from the site to the processing centre was accomplished through the use of a direct dial-up modem connection. However, within nine months of system commissioning, automated transmission of data using Internet protocols was achieved. This was a major advance towards the goal of automated, cost-effective monitoring of multiple sites as no human intervention was needed for routine system operation and long-distance call charges were more or less eliminated. 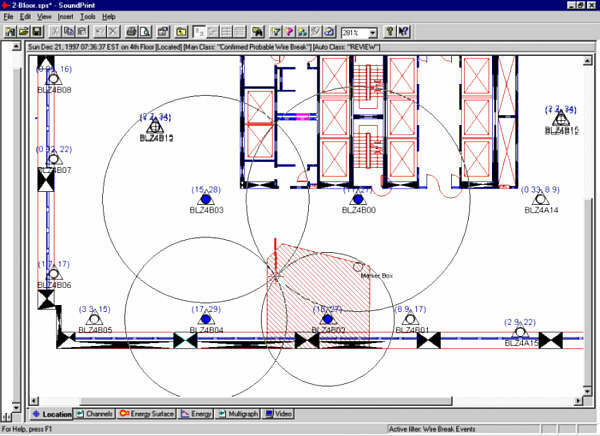 Presently, over 300,000 square meters of unbonded post-tensioned slab in twenty structures plus numerous pipelines and bridges are being simultaneously monitored The analytical software is capable of semi-automatically generating reports summarizing the time and location of wire breaks and other significant events. The operating efficiency of the system over the monitoring period is also recorded on the reports. Highways Agency appointed the UK Transport Research Laboratory (TRL) to evaluate the acoustic monitoring system for use on grouted post-tensioned bridges. Initial tests were carried out on a free-standing bridge beam at the Laboratory's Crowthorne facility. The work by TRL is only briefly summarised here, as more comprehensive details are included in a paper by Cullington et al. The test protocol consisted of causing accelerated corrosion of grouted wires; as well as external wire breaks using a test rig designed to simulate fully-grouted and partially-grouted wire failures. Other events caused by impacts were also generated. The beam was monitored from Pure Technologies' processing center in Calgary, Canada, where reports were generated summarizing the event classifications and locations. In a combination of open and blind testing, the system correctly identified all 25 wire breaks generated. To test the system under normal highway operating conditions, instrumentation was installed on a section of a highway bridge at Huntingdon, 90 km north of London. The bridge has cast-in-place 32-meter main spans with cantilever spans that support precast beams. The cast-in place-spans are of grouted post-tensioned box girder construction. Sensor density on the cantilever slab is approximately one per 25 square meters. Additional sensors were placed on the main span to provide information about signal attenuation. Sophisticated software filters were designed to eliminate most spurious acoustic activity at the site-based acquisition system and only relevant events are transmitted to the Calgary processing center. The system correctly identified 41 out of 44 test events generated. The system will remain in place on this structure for the foreseeable future. The success of the testing at Crowthorne and Huntingdon is likely to lead to the system being included in the Highways Agency's list of approved monitoring methods. In October 1997, the monitoring system was tested on the Bronx Whitestone Bridge in New York City. This bridge, with a main span of 701 meters, was opened to traffic in 1939 and is owned and operated by MTA Bridges and Tunnels, an agency of the Metropolitan Transportation Authority of New York. The monitoring system was installed during a rehabilitation of the main cables. This work involved removal of the circumferential wire wrapping, repair of broken wires and the application of corrosion-inhibiting oil to the wires. Consequently, it was possible to cut wires in the cable to test the system's recognition and location capabilities. Single sensors were attached to six cable bands, each 12.2 m apart. A portable acquisition system was set up at deck level (Figure 8) and the testing was done while construction work was in progress. Six wires were cut within the monitored section in a blind test. 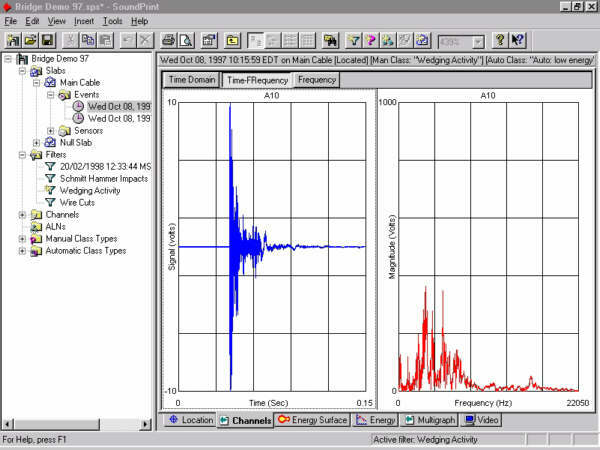 The system correctly classified the events and located them longitudinally with errors ranging from 0.0 m to 0.7 m. Acoustic events caused by steel chisels being driven between the wires were easily identified and filtered. Figures 9 and 10 show plots of the response of sensors to a wire break and construction activity respectively. Fig 8: Testing of monitoring system on the Bronx-Whitestone Bridge. Fig 9: Time domain and frequency spectrum plots of wire break detected by sensor 5.0 m from event. Fig 10: Sensor response to steel chisel impact 6.0 m distant. Analysis of the data generated during the test showed that sensors mounted on alternate cable bands would be able to provide information of sufficient quality to permit reliable identification and location of wire breaks. A complete system based on this configuration is presently being installed. system through a coaxial trunk line attached to the existing messenger cable. Durability issues and ease of installation and maintenance were major factors in the design of the hardware. The sensor mounting brackets are designed to permit installation without modification to the cable band assembly and without damaging the paint system. Data is transmitted over the Internet to the Calgary processing center, where it is analyzed and archived. The data is also routed from the Calgary center to a second data processing computer located at the bridge administration building, and placed on a secure Internet site available to the owner. This will permit bridge operations personnel to review the data and reports using the same proprietary processing software in use at the processing center. Testing is currently in progress at TRL and on the George Washington Bridge in New York City to determine the effectiveness of the monitoring system for long-term damage monitoring of suspender ropes. Results indicate that the system is capable of detecting and locating fatigue failure of wires in a locked-coil rope. 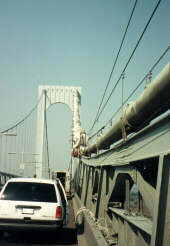 A system was installed on the George Washington Bridge in November 1998 to monitor three sets of suspender ropes. The purpose of the installation was to evaluate the durability of the system over a complete climatic cycle. To date, the operating efficiency of the system has been over 99%. In early 2000, the suspender ropes were removed for routine forensic examination. During the removal process, wire failures by accelerated corrosion and other methods were generated so that the "SoundPrintÒ" of these types of events can be acquired by the monitoring system. This information will be used to develop processing filters for a potential permanent installation. The monitoring system is particularly suitable for use on cable-stayed bridges. Because of the fact that, after construction is completed, visual inspection of cable components is not possible, the system can provide reassurance about the long-term integrity of the wires. In order to evaluate the performance of the system in this type of application, a prototype system was installed on the Alex Fraser Bridge in Vancouver, British Columbia. This bridge has a main span of 450 metres and has a total of 192 stay-cables consisting of parallel wires protected by HDPE sheathing. The wires are anchored in zinc castings. The longest stay-cable is approximately 250 m.
Acoustic sensors were installed on the deck and pylon anchorage assemblies of forty-eight stay cables on the southeast section of the bridge (Figure 11). The sensors were connected by coaxial cable to the acquisition unit located inside the southeast pylon leg. It was not possible to cut wires in the cables to calibrate the system. Therefore a rebound hammer was used to verify that events with similar frequency and energy characteristics to wire breaks occurring at one end of a stay-cable could be detected and identified at the other end. This capability was confirmed for all lengths of stay-cables on the bridge. No wire breaks have been detected during the period of operation of the system. A continuous vibration monitoring system has recently been installed on three of the cables. The same acquisition system is used for both systems. Corrosion of prestresing wires in concrete pressure pipes has caused over 600 failures over the past ten years. The consequences of such a failure occurring in an urban area can be significant, both in terms of damage and interruption in service. Acoustic monitoring can be very effective in identifying and locating wire failures in pipe sections so that pre-emptive measures can be taken to prevent catastrophic failure. Pipeline monitoring systems use hydrophones in the water flow instead of sensors attached to the concrete. The water in the pipe is used as the acoustic medium. The hydrophones can either be inserted individually into the pipe, or as an array fed into the water stream. In all except the largest diameter pipes, the array configuration provides increased system flexibility, lower cost and improved locating resolution. The installation can be used either as a temporary survey device or as a long-term monitoring system. 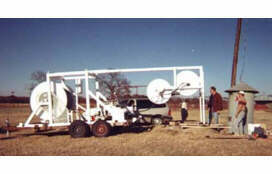 Figures 11 & 12 show a 500m long array being inserted into a 6m diameter pipeline (a hydrophone is visible near the top of the ladder in Figure 12). Location resolution is within 1 meter. Arrays in excess of 1600m can be deployed. Up to May 2000, SoundPrintÒ Acoustic Monitoring has been deployed in over ten pipelines, in both the acoustic station and acoustic array configurations. In numerous applications Owners need to know the effect of a seismic event on their structures. This is particularly important in seismically active zones and in the nuclear sector where seismic standards are rigorous. In California where there is a statutory requirement to report on the effect of a seismic event within 24 hours, SoundPrint acoustic monitoring has been used to provide rapid and relevant details to the Owner. Above-ground prestressed water storage tanks are common in many areas of the world, including California. Failure of these tanks due to corrosion or other factors can be catastrophic. To investigate the usefulness of long term acoustic monitoring as a management tool, the East Bay Municipal District of Southern California commissioned the installation of a monitoring system on the Brookwood reservoir, a 10 million litre capacity tank in the Walnut Creek area East of San Francisco. As part of the commissioning process, two individual wires were corroded to failure and the results monitored with the system installed there. Both wire breaks were detected and located successfully within 300 mm of the actual location. 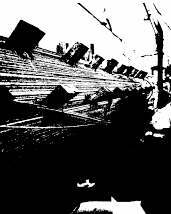 At 18.06 on 17 August 1999 there was a Mercalli 5 earthquake in the Bay Area of California. At 23.04 SoundPrint recorded 1 wire break at the water tank resulting from the earthquake some 30-km distant. Details of this minor damage were e-mailed to the owner within hours. With this data the owner was able to report quickly, and positively, recording only minor damage. With the proven success of the system the owner is planning to extend the number of structures monitored. If many sites were monitored, the owner can also use the rapid notification capability of the system to direct emergency repair teams to the areas where most damage has occurred in the event of a large earthquake. Because the data acquisition and processing software permits continuous real-time data transmission and analysis, it is possible to make on-demand reports available to authorised users through a web page interface. Automatic e-mail notification alerts the user to the occurrence of a significant event. Fig 13: Typical user-defined query using Web interface. Using password protection, the user can enter sites for which they have clearance and generate reports to their own specifications. User-defined parameters include reporting period, event classifications, event locations and temporal distribution of events. An example of a typical user-defined query is shown in Figure 13. Once the parameters have been defined, presentation-quality reports can be generated in either Word or PDF format. These capabilities provide users with immediate access to information about the performance of their structures or infrastructure. This addresses one of the main concerns with instrumentation systems, i.e. the collection of large amounts of data, which requires intensive manual post-processing to provide useful information. The development of fast, inexpensive computing and data acquisition hardware, combined with the availability of low-cost Internet data transmission has led to development of a dependable remote continuous acoustic health monitoring system for bridges, other structures and PCCP pipelines. The ability of the system to identify and locate events of interest in noisy environments has been verified for unbonded and grouted structures as well as for suspension bridges. The information provided by the system can be used to accurately identify localized areas of deterioration in very large structures using widely distributed sensors. Systems installed prior to intrusive inspection of the structure can help to determine where to focus the inspection. Systems installed after inspection or repair can ensure that the long-term durability performance of the entire structure can be quantified. The ability of the system to determine the time and location of significant events permits confident statistical modeling of deterioration. The adaptation of the system to provide information from other instrumentation or recording media, using the acoustic data as an acquisition "trigger", has resulted in its use as a continuous surveillance system for impact and seismic damage. Real-time, user-defined, on-demand generation of reports using a web interface allows users immediate access to useful information from the instrumentation system. Elliott, J.F., "Continuous Acoustic Monitoring of Bridges", International Bridge Conference, Pittsburgh, Pennsylvania, July 13 - 16, 1999. Cullington, D.W., Bradbury, T., Paulson, P.O., Continuous Acoustic Monitoring of Steel Tendons and Cables in Bridges, Bridge Engineering Conference, Guildford, Surrey, UK, April 16 - 19, 2000.